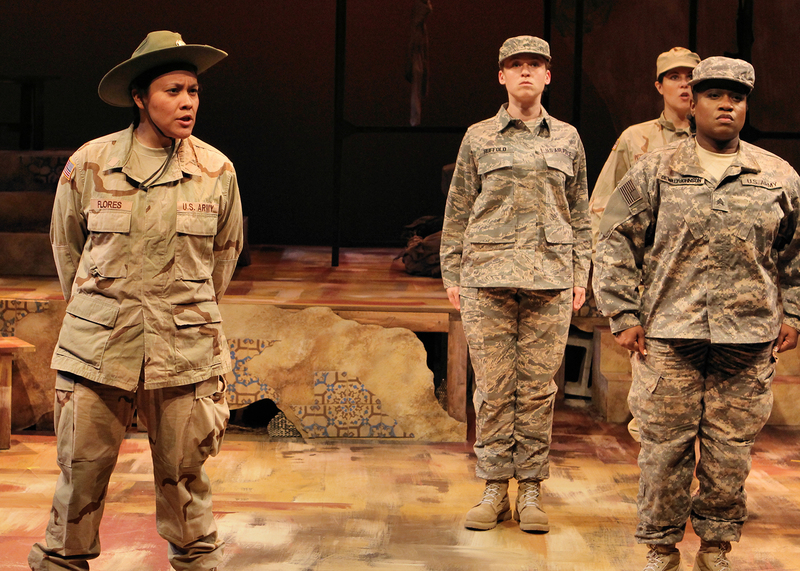 Army drill sergeant Santiaga Florez (Rhiana Yazzie) trains recruits (l to r: Dawn Brodey, Shana Berg, Jamecia Bennett) in “Lonely Soldiers: Women at War in Iraq” at History Theatre. Photo by Scott Pakudaitis. By LIZ BYRON As a self-identified pacifist and feminist, I was interested in the prospect of hearing women soldier’s perspectives on the war in Iraq. And as I’ll admit that my knowledge of life in the US armed forces is very much limited to major news headlines and Hollywood blockbusters, I was hoping that History Theatre‘s production of Lonely Soldiers: Women at War in Iraq would give me some insight as to what it’s really like: why do different women enlist? What are their day-to-day experiences? Would they re-enlist? What happens when they come home? Well, the play certainly delivered, with so much food for thought, I’m still digesting a day later. That said, I’m not sure it’s a great play — but I’ll get to that. Lonely Soldiers is one of two plays being performed at the History Theatre throughout March. It’s being shown in rotation with The Things They Carried, a one-man show about the Vietnam War. In contrast with Things.., Lonely Soldiers deals with a much more contemporary aspect of the US military. Based on Helen Benedict’s non-fiction book of the same title, Lonely Soldiers tells the stories of multiple women soldiers who served on the frontlines during the early years of the Iraq war. Starting with the tales of how and why they enlisted — many of them requiring parental waivers for enlisting under the age of 18, and many of them joining as a desperate means of escape from unpleasant living situations — the play goes on to explore their arrivals in Iraq, their day-to-day lives while deployed, the trauma they experienced on the frontlines, and then the struggles they faced returning to life in the USA. Most of their stories are not cheerful ones; the audience hears of sexual harassment and feelings of alienation, and of sexual assault blamed on the victim and covered up by higher-ranking personnel. We hear of confusion as to the goal and the outcome of the Iraq War, poor management, and contradictory orders, not to mention violence, loneliness, and extreme alienation upon returning home. 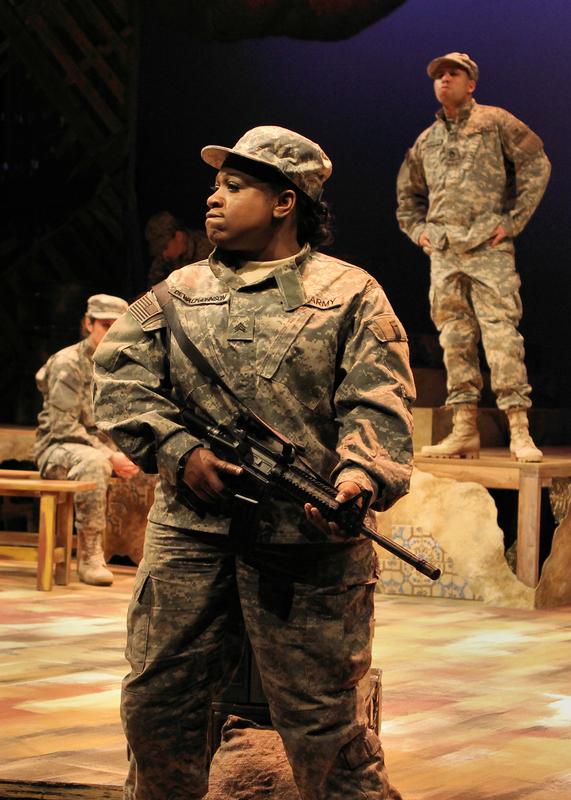 Soldier Terris Dewalt-Johnson (Jamecia Bennett) in “Lonely Soldiers: Women at War in Iraq” at History Theatre. Photo by Scott Pakudaitis. “play” rather than a dramatic reading of a nonfiction book. A colleague once said, while writing a book review of a first-hand account of the Holocaust, “It seems like you shouldn’t critique the writing, when the subject is what’s important.” And yet, it’s frustrating when an important message gets blurred by poor presentation. Lonely Soldiers doesn’t suffer from poor presentation, but theatrically speaking, it isn’t fantastic. But does that matter? Once the house lights came on after the show (an easy 90 minutes, by the way), I had only vague impressions of the staging (quite good), the set (simple, and the better for it), the lighting or costuming (no complaints), or even the acting (good, if uneven; Jameca Bennett as Terris Dewalt-Johnson, Tamara Clark as Clara Henderson, and Rhiana Yazzie as Santiaga Flores gave particularly compelling performances). The vast majority of my thoughts were on the subject matter; wondering how and why the military manages to cover up so much abuse and harassment, wondering how many soldiers in the Iraq War came home with the same negative view of the military and aforementioned war, wondering what it would take for military life to improve for women, and wondering, most of all, how someone could hear any one of these stories and ever want to join the military. I was, in fact, surprised at how anti-war and anti-military this piece was. Ultimately, this may not be the best piece of drama out there, but it is certainly compelling, and has a lot of important things to say that I believe more people need to hear. Lonely Soldiers: Women at War in Iraq by Helen Benedict. March 15-April 6, 2014 at the History Theatre, 30 E 10th St, St Paul, MN. Recommended ages 16+. Tickets $32-40; $2 off for 60+, $15 for students, and discount rates available for groups of 12 or more — at (651) 292-4323 or http://www.historytheatre.com/tickets (Audio described and ASL-interpreted performances on March 29). Hello colleagues, nice article and pleasant arguments commented here, I am actually enjoying by these. without considering the strain on the engine. a very costly affair and can be avoided by regular service. viewers, ѡho аrе wishing in favor of blogging. Puis-je prendre deuх-trois lignes pour mon site perso ? over everything so you should be able to find something to wash other than just car lots. staggering so letting them wash their car in a way that makes them feel good is a win-win situation for everyone. am no Spring Chicken, so this company has been around a long time.